The Handball Federation of Nigeria (HFN) has charged the U-18 and U-20 junior girl teams in the ongoing African Zone 3 World Cup qualifiers to stick to their winning spirit. HFN President Samuel Ocheho told the News Agency of Nigeria (NAN) on Wednesday in Lagos that the teams had performed credibly in their matches. 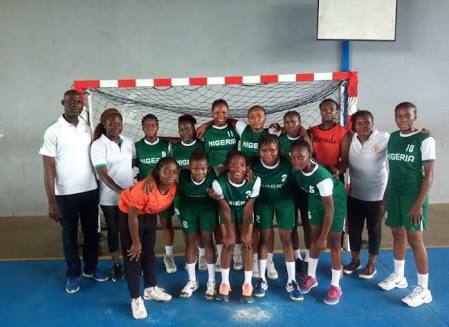 Nigeria’s U-18 girls in the cadet category defeated Togo 50-11 in their first match, beat hosts, Benin Republic 34-22 in their second match of the International Handball Federation (IHF) tournament holding in Niamey. In the U-20, the junior girls lost narrowly to Benin Republic 32-28 points in their first match and defeated Togo 31-19 in the second match played on Tuesday. “The performance of our girls’ teams in the tournament is giving me joy and I urge them to sustain the winning tempo in their remaining matches because they are really doing well. “Particularly, the cadet category have won their two matches convincingly and the junior girls are also pulling their weights which gives me the hope of them lifting the trophy,” he said. Ocheho said that he was looking forward to having the national cadet and junior teams qualify in the Zone 3 continent of the tournament which serves as part of the qualifiers for the World Championships. He, however, called on the teams to be objective, adding that the handball family and nation at large was counting on them to bring back the IHF Challenge Trophy and book its place in the intercontinental tournament. “We are full of expectations and the target is for the girls to win the tournament in this zone 3 of the continent so as to have a good ground towards world championships. “This tournament serves as part of qualifiers for World Championships, so the idea of our winning is beyond this tournament and I know that the teams are capable,” he said.